The new TV series "Payitaht Abdülhamid," recounting the life of the 34th Ottoman Sultan Abdülhamid II, will be broadcast on Turkish TV channel TRT starting in February. 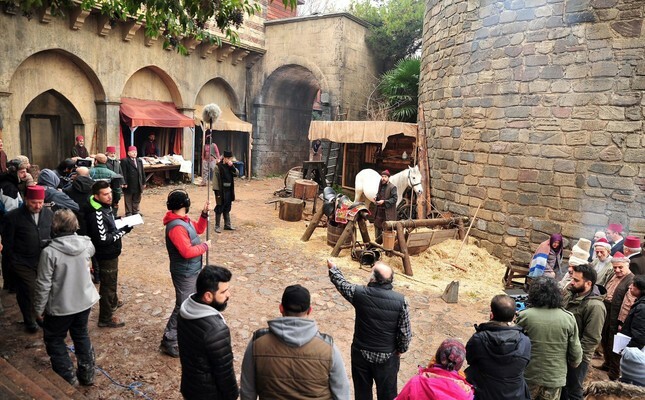 The series is being filmed on Seka Film Studio's sets, which have been decorated in the style of the period and feature purpose-built replicas of some parts of Istanbul's Yıldız Palace. Produced by the co-founders of Es Film, Yusuf Esenkal and Serdar Öğretici, the series stars Bülent İnal as Abdülhamid II. As well as İnal, the series features nearly 50 actors for main characters, with a cast of more than 400 actors in every episode. A team of 120 technicians will provide assistance for the series. Producer Yusuf Esenkal, speaking to an Anadolu Agency (AA) correspondent, offered insights into the much-anticipated TV series. He said that they have begun a huge production with hopes to produce the best period TV series that has ever been made in Turkey. Talking about their outstanding TV series "Filinta," an Ottoman detective story and a TV-first, Esenkal said it was an experimental project for them. "'Filinta' is a totally different project in terms of its production, script and special effects. With 'Payitaht Abdülhamid' we have raised the bar and will try to make a better TV series in every way. We are working with very talented people from Turkey as well as from around the world." Esenkal stated that the series will begin with the 20th anniversary of Sultan Abdülhamid II's succession and follow the important incidents that made history during his reign. "The series will show the 'Greek War' which the Ottomans won after many years of loss. The series will also feature the First Zionist Congress, the construction of the Hejaz Railway and the debate over the lands of Palestine which the Ottoman sultan did not give away to the Western powers. The only message we want to deliver with 'Payitaht Abdülhamid' is to 'fight until the end.'" Esenkal said they renovated the film studio from top to bottom for their new TV series and restored the entire exterior decor, as well. He said all the interiors were designed according to traditional 19th century Ottoman decoration and replicas were built of some parts of Yıldız Palace. Apart from Abdülhamid II, other crucial characters of the period will also be featured in the series. In addition to Seka Film Studio in İzmit, the film crew will use other historical places for filming, such as the original Yıldız Palace in Istanbul, Dolmabahçe Palace and the Eyüp district, as well as the provinces of Yalova and İzmit. "Payitaht Abdülhamid" will be directed by Serdar Akar, with cinematography by Sami Saydan and art direction by Reza Hemmatirad. The series' visual effects will be undertaken by Digiflame and the score by Yıldıray Gürgen. The project has been put together by Osman Bodur, with a script written by the team led by Bodur and Uğur Uzunok. The producers are also working with an advisory committee of historians. Esenkal said that casting of the actor to play Sultan Abdülhamid II was a very difficult process and continued: "Although it was a very tough casting process, we had wanted Bülent İnal to play Abdülhamid for a very long time. Yet we were not able to offer him the role due to other projects that he was involved in. As soon as he was done with the other projects, we offered him the role and began filming the series. The cast of the series also has other accomplished actors as well. It is a very large cast. Tuncay Altunoğlu, who puts all his efforts into the project, is our casting director. As 'Payitaht Abdülhamid' is a historical drama and it also involves international stories, it is not possible for us to film the series with a small cast. There are almost 50 main characters in the series. If we include the actors who join the cast for each episode, this number increases to 400. We also have a team of 120 technicians. Additionally, we will feature the veteran actors of Yeşilçam (Turkish cinema) as much as we can." Esenkal noted that television is a very popular media and people prefer to be informed not via written media but through visual media. He said they hope that the series will increase interest in history. He added that the audience prefers these historical series to remain faithful to history and said: "If you are filming a historical TV series and feature real characters, you cannot drift away from reality. And if you are not intending to film a documentary, you need to include elements of drama and a little bit of fiction, as well. However, the more you stick to the history, the better." Stating that it is hard to estimate how much the series will cost and how many episodes will be filmed, Esenkal said that production companies usually put a lot of money into a series and the return of this money is only possible after a third season. Recalling their first project "Filinta," Esenkal continued: "I would like to thank İbrahim Eren, the deputy director general of TRT, for giving us a chance with 'Filinta.' Both our project and Mehmet Bozdağ's 'Resurrection Ertuğrul' were the first historical series on Turkish televisions and they were realized thanks to Eren's encouragement and support. 'Filinta' was supposed to air for three seasons; however, we decided to leave it when it was good. The last episode of the series was broadcast as the season finale yet we and the channel decided to end it."